Hi. I'm a senior at UT Austin studying computer science. I'm currently passionate about startups, full stack development and functional programming. ListenApp is a mobile app whose purpose is to improve daily communications between anyone. Calling is too old fashion for this advanced social world and sometimes texting just doesn’t get the job done well enough. ListenApp is essentially a walkie-talkie that a user can install on their phone. It allows for simple quick direct voice messages which make it much shorter than a call and much quicker than a text. It will run on my server making it internationally available. The main feature which makes it different than texting and even Yo or whatsapp is that it is all immediate; when a voice message is sent, the receiver’s phone will automatically vibrate, show a notification and play the message out loud. If it isn’t convenient for you to receive voice notes, it can be adjusted with the default phone volume. This means that if the phone is on silent, the voice will be diminished while still receiving the notification and vibration to alert you that someone sent a voice note. These following scenarios are just a few of the many daily examples that would simpler if used with ListenApp. Imagine how these situations go using text or calling. Texting on average takes a minute or two so if you need an immediate response, it usually just isn’t convenient. Calling is the alternative option, but it just takes more effort. ListenApp falls right in between texting and calling and just ends up being the most comfortable way. Let's take out the tedious parts of writing an essay and bring term papers into the 21st century! 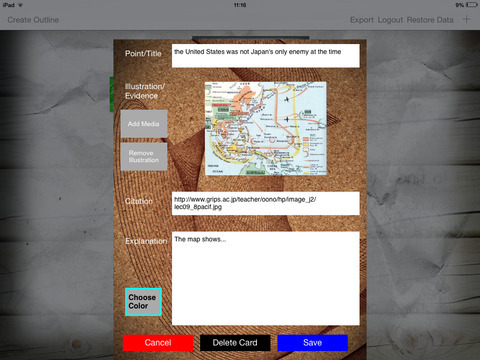 This app lets you create notecards with topic sentences, points, illustrations (with images! videos coming soon...), citations and explanations. You're able to organize the notecards by color and move them around the screen to help layout your essay. The data is backed up to a cloud so don't worry about losing what you've written. Once the notecards are done, the app will create an outline based on the order you define and if you're happy with the outline, the app creates the essay (all you need to do then is to write the transition sentences) and the citation page which you can export. Our website for more info is Who's Hungry. his is an app that is meant to streamline the process of getting a group of people together to go out to eat on short notice. When students like you and me only have 1-1.5 hrs to eat, and you don't want to eat alone, texting all of your friends individually, or using group chats can be laborious. This, removes (entirely) the need for texting to meetup to go get a bite to eat on the fly! Klink is a friendly educational game for children and aims to improve their language, enrich their vocabulary and learn to spell words in Hebrew. When the image appears on the screen, you need to type the animal you see. Clicking on the picture expresses out loud what the photo is. This game is compatible with any phone running the Android operating system and comes with a built in Hebrew keyboard. I would love to get feedback and requests for improvements. Need a way to text the same message to many people without creating a group chat? Android can do it, why not iOS? 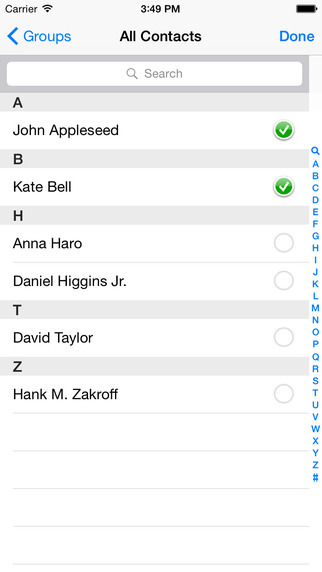 MassSend is a free, convenient, and reliable way to send messages to many people without creating a group chat. All while staying within the comfort of your default smartphone messaging app. It does not “hold the conversation” within the app but instead is just to send the first message without having to copy and paste to every recipient. Normally, phones would create a group message, but with this app it will send them individually. It does not replace the messaging app or act as a new one, it simply is a way to send many messages at once without copying and pasting or creating a group chat. When inviting a large number of people to an event, sending 50 individual messages is tedious. No one likes to copy and paste that much. This way, type it once, add the recipients, and click send. Easy. This is a web application that provides practice tests for the math MCAS for grades 6th, 7th and 8th. It is a friendly and easy to use application that is very helpful and will improve your MCAS results. There are 10 tests for each grade with answers. Enjoy! Can you guess which Hebrew word it is even if it is missing some letters? This game is compatible with any phone running the Android operating system. I would love to get feedback and requests for improvements. Did you see that?? In this thrilling game, you are racing against the clock to find that one black pixel floating around in a sea of millions. Step up to the challenge and find the pixel! Think you can outsmart the computer by cracking the code? You can play it on themathmom's website here. Trova la Parola is an educational game for children. The goal is to enrich the italian vocabulary of children by having fun. 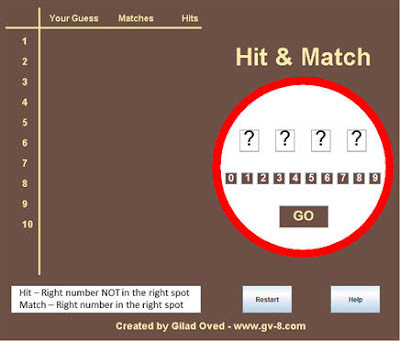 In every word there is a missing letter, the player must guess and type it on the built in keyboard. There are three chances to guess the correct letter, then you must move on to the next word.